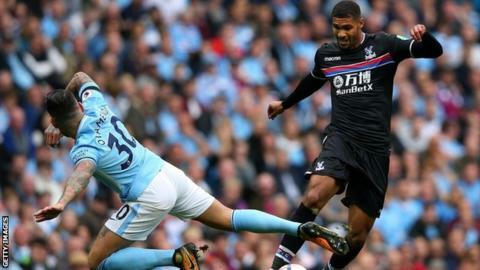 The decision to move Manchester City's Premier League game against Crystal Palace to New Year's Eve is "totally unacceptable", says a City fans' group. The match at Selhurst Park, originally scheduled for 30 December, will be played at 12:00 GMT the following day and broadcast on BT Sport. Kevin Parker, general secretary of the Manchester City Supporters' Club, said he is "appalled" by the fixture change. The match is the only Premier League game on New Year's Eve. City travel to Newcastle United on 27 December, while their home game against Watford scheduled for 1 January 2018 will be moved given they will play on 31 December. "To say I am upset by these changes is an understatement," Parker told BBC Sport. "As City fans we were facing two away games and one home game over the Christmas and New Year period. "Now, not only do we swap from a Bank Holiday game to an evening away game on 27 December, and then an away game at noon on New Year's Eve - to the most difficult London game you can get to - but we also lose our only home game on New Year's Day." Premier League executive chairman Richard Scudamore said: ''We appreciate this is the peak time for supporters attending and watching the Premier League. "With matches scheduled on Christmas weekend for the first time in 11 years, the process of selecting games for live broadcast has been a more complex one than usual. "When selecting matches, the broadcasters are using the rights that we the Premier League and the clubs have sold them, and they should therefore not be criticised for doing so." The game between Manchester United and Southampton at Old Trafford has been moved from 15:00 to 17:30 on 30 December. No Premier League match will take place on Christmas Eve, despite suggestions that the Arsenal-Liverpool fixture was set to be changed from 23 December.